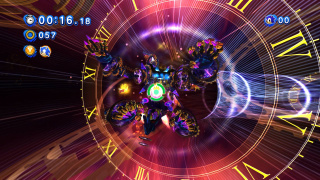 The Time Eater is the final boss in Sonic Generations. It was found in deep space by Dr. Eggman some time after the ending of Sonic Colours, who decided to use its properties of manipulating time and space to erase his past defeats. However, he realized he would not be able to do this alone, so he asked his past self from Sonic the Hedgehog 2 to help him with modifying the Time Eater for their use. Once perfected, they used the Time Eater to rip places from Sonic's history and place them in the White Space, then ruined the hedgehog's birthday party and sending his friends to the White Space. The fight takes place in a strange void, supposedly created by the Time Eater itself. You fight him as both the Classic and Modern Super Sonics. The monster will sometimes switch perspectives, and you can switch perspectives at any time by hitting the special move button. The perspective change allows you to dodge attacks between dimensions, and each perspective comes with its own advantages and disadvantages. In 3D, more space allows for greater evasion of flying objects and attacks. Rings are in bunches; however, they can be harder to find and obtain. In 2D, the reduced perspective make ring gathering a breeze, but dodging attacks in this perspective is considerably harder. The Time Eater will throw random objects at you to try and block your path (you can throw your partner into these to clear the obstacles in your way), as well as warping its hands through time and space to attack you. To attack the monster, simply make it to its core and touch it. Being Super, you will overload the monster and damage it as a result. Do this thrice. On its fourth and final hit, the Time Eater will do a combined Classic and Modern Eggman attack involving a huge energy sphere. Pushing the triggers/bumpers on your controller together will dispel this attack. The attack will backfire and the monster will explode, throwing all the characters out of the void sans the Eggmen. In the English script, Classic Tails refers to Classic Eggman as "Dr. Robotnik" when they see him before this battle. This latter is the name that he received when the pre- Sonic Adventure Sonic games were localized for English-speaking territories. Classic Eggman responds: "Nobody calls me that anymore."